The energetic co-founder and CEO of Sustainable Coastlines, Sam Judd thinks big. And he's rapidly making inroads on a global scale. Since 2008, Sam has been resolute on reducing plastic and food packaging rubbish that collects in drains, waterways and around our coastline to end up in oceans, seriously threatening the lives of vast numbers of marine mammals and birds. Sam has collaborated with numerous experts; built a network of passionate volunteers and an impressive list of sponsors to fund large-scale coastal clean-up events, educational programmes, public awareness campaigns and coastal planting projects. He also corralled inmates at Auckland Prison to take up tools to build the Sustainable Coastlines Flagship Education Centre at Wynyard Quarter, where Sam and 10 staff coordinate the charity’s activities. In exchange for connecting old shipping containers and recycling wooden pallets as decking and cladding, Sam shared his knowledge about waste and water quality. In the process, prisoners learned valuable welding and joinery skills that have seen them get work outside the prison walls to reduce the rate of re-offending. 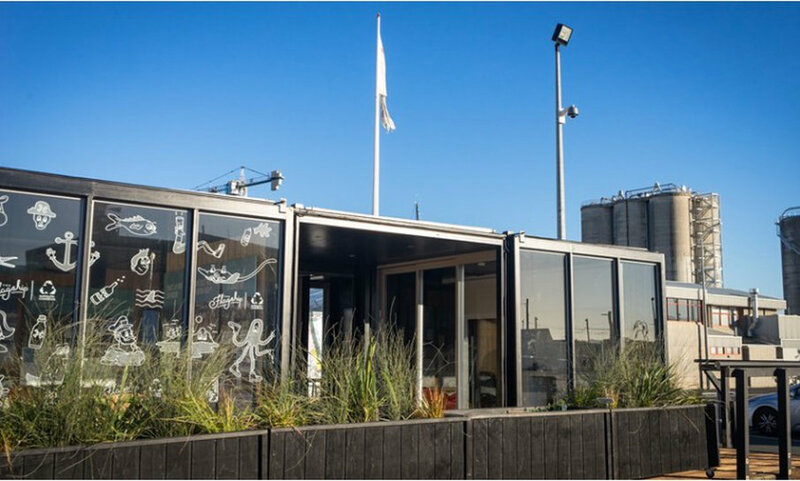 Now, Sam is winning the race which will likely see the Flagship Centre, with its modular design by Jasmax Architects, become Auckland’s first Living Building in the global Living Building Challenge. The challenge promotes a rigorous degree of sustainability in the built environment and is incredibly challenging. In addition to meeting the most rigorous performance standards they estimate to have created the structure from over 85% built of salvaged materials. A host of innovative features too long to list, includes a membrane roof system that improves the building’s insulation levels and can even decompose airborne pollutants into non-toxic by products, offsetting the equivalent of over six cars worth of emissions. It all started on the other side of the Pacific in the Galápagos Islands, where Sam was surfing with his mate. Sickened by the rubbish they saw piling up on the world heritage site, Sam organised a large-scale beach clean-up. It made such a significant impact that Sam won an international environmental award for his efforts. When he arrived back in New Zealand, he wasn’t ready to give up “his pirate lifestyle” to apply his hard-earned law degree in an office. Instead he gained a job free-diving for sea urchins in the Hauraki Gulf and Northland. On Great Barrier Island, he saw piles of rubbish accumulating and decided to run another clean-up. In five weeks, he raised $45,000 to get 700 volunteers involved in a clean-up that removed 2.8 tonnes of debris. Feedback from school principals made Sam aware that though these 10 and 11 year-old kids live a 15-minute drive from the beach, more than a quarter had never been to the beach in their life. So, he shifted his focus and Sustainable Coastlines began running educational programmes. Then he went on to create team building events with corporates who wanted to get involved. It proved a brilliant way to generate an income so they could employ and train staff to work on the cause. The Sustainable Coastlines Flagship Education Centre is clearly a fitting showcase for sustainability and aligns perfectly with the charity’s push for a more eco-friendly lifestyle, especially in an urban setting. But to complete it and to win the Living Building Challenge, Sam and his team are looking to activate more partnerships that will not only fund the centre but exponentially increase their impact on saving the world from plastics. So if your business wants to be a partner, email Sam Judd on sam@sustainablecoastlines.org or call 021 058 9349.